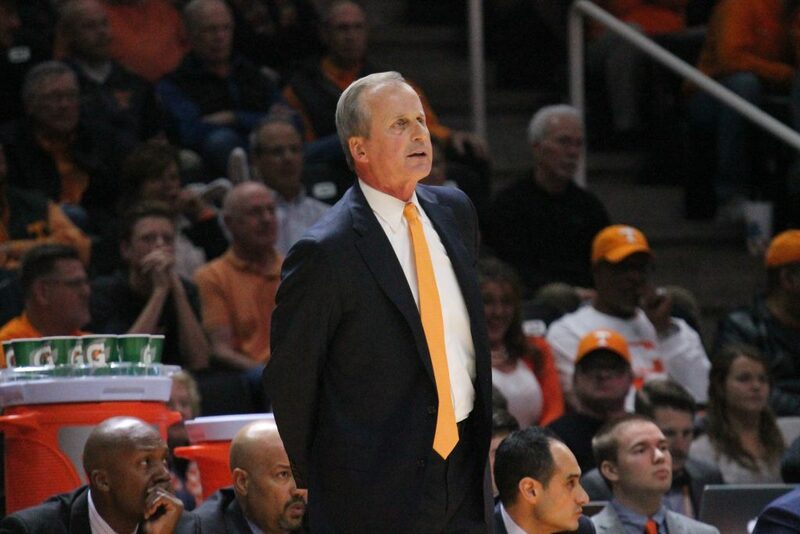 Coming off a 22-point road win over South Carolina earlier this week, Rick Barnes met with the media to recap the win over the Gamecocks, give an update on Jordan Bowden, and preview the Vols’ next matchup with Texas A&M. Here’s what Barnes had to say on Thursday afternoon in Pratt Pavilion. Aside from the win, the biggest storyline following the Vols’ game over the Gamecocks was that Bowden didn’t play. Nobody outside of the program knew about Bowden’s injury until the SEC Network announced he had hurt his knee during shootaround earlier that morning. Even more surprising, Barnes didn’t know Bowden wasn’t going to play until minutes before the game. No. 1 Tennessee would go on to win by 22 despite Bowden sitting out. In his place, Lamonte Turner and Jordan Bone combined to score 32 points on 12-of-21 shooting. Admiral Schofield also stepped up, scoring a team-high 24 points. Though the injury popped up out of nowhere, there’s no serious cause for concern. Barnes promised after the game that Bowden would be ready for Texas A&M. He reaffirmed that on Thursday. “They’re still working on him,” Barnes stated. “We’ll probably know more tomorrow, and he’ll be fine. I’ll be surprised if he isn’t ready to play because he’s a hard one to keep out. Bowden is averaging 10.9 points per game this season and 16.2 points per game in six SEC contests. Tennessee is nearly two weeks into being ranked No. 1 in the country. Following an overtime scare against Vanderbilt in their first game ranked No. 1, the Vols have won back-to-back games by 17 points and 22 points. With games coming up against teams that Tennessee is far superior than on paper, it’s all about staying on track now that the initial shine of being the top-ranked team has worn off. “You have to expect people to play their best basketball, and I think our guys understand that,” Barnes explained. “I also think now more than ever that they more about what we do. Tennessee’s big post presence hasn’t had the best stretch of games lately. In wins over West Virginia and South Carolina, Kyle Alexander fouled out after playing just 12 minutes against the Mountaineers and 10 minutes against the Gamecocks. In each game, Alexander was 1-of-3 from the field for two points. He’s grabbed seven rebounds in both games combined. Barnes also said that Alexander simply being in tune with the scouting report would help him as well. “We specifically walked him through that situation, because he got that called on him the year before.” Barnes said. “He had it in shootaround and did not execute it. The top-ranked Volunteers now turn their attention to a Texas A&M team that has had a miserable season to this point. With the loss of veteran guard Admon Gilder, it’s taken the Aggies a while to settle in and find their identity on the offensive side of the ball. Sophomores TJ Starks and Savion Flagg have stepped up in Gilder’s absence, leading the team in scoring at 13.3 points per game and 12.3 points, respectively. Junior Wendell Mitchell is leading the team in scoring throughout SEC play at over 11.0 points per game. Texas A&M sits at just 8-11 on the season and 1-6 in conference play, but last week in the SEC/Big 12 challenge, the Aggies pulled off an impressive win over a red-hot Kansas State team. “Billy Kennedy is one of the best coaches there is around,” Barnes said. “What stands out to me is that they beat a team last week that was playing as good as anybody. They handled them pretty easy and hung around with LSU. Tennessee and Texas A&M are set to tip off from College Station at 8 p.m. ET on Saturday.